The county planning staff recommended approval of the projects, and the Planning Commission voted unanimously on June 15 to send the projects forward to the Commissioners with a positive recommendation. County Utility Department Director Chris Thomas said Williams and Associated had presented data on sewage flow from the site that addressed his concerns about the ability of an existing pump station on Mars Hill Road at Barber Creek to handle the sewage the project will generate. The Board of Commissioners on May 7 approved a change in county sewer policy to allow Williams and Associates and developer Nichols Land and Investment Company to obtain sewer capacity for the assisted living facility as a commercial rather than residential project, since the county does not have residential sewer capacity available at this point. Thomas told me in a telephone conversation on July 19 that sewage from the site will flow under SR 316 through an existing line that follows an unnamed tributary of Barber Creek. That line flows to the pump station on Barber Creek at Mars Hill Road. From Barber Creek, the sewage will be pumped to the Land Application Site on Rocky Branch Road for treatment. Thomas said he reviewed the flow data provided by Williams and Associates and concluded that it will not be necessary to upgrade the existing pump station at Barber Creek. If, in the future, it will be necessary to upgrade the pump station because the flow is heavier than Williams and Associated predicted, the Resurgence Park users will be required to pay for the pump upgrade, Thomas said. The county already has approved site development and land clearance plans for one of the three properties to be considered for rezone on Tuesday night, according to Planning Department Director B.R. White, and construction crews already have cleared the lot. White said the county could approve the plans because the land already is zoned for business use and the plans were consistent with that classification. That lot will be home to a medical office for Georgia Skin Cancer and Aesthetic Dermatology, according to the signage on the site. The rezone documents identify the building as a 18,700- square-foot medical office building with an estimated value of $3.6 million. Entrance to the lot will be from Virgil Langford Road. The 2.5-acre lot has been split off from the larger property, according to the narrative, and is owned by Water Oak Investments LLC, 1591 Autry Road, off Hodges Mill Road. When Williams and Associates submitted initial plans for the Resurgence Park in early May, it showed the remaining 28 acres as a single tract. Documents the planning firmed submitted on June 20 showed just less than 5 acres split from the larger tract and designated as the location of a five-story, 100-room hotel. Total value of the building is expected to be about $11.6 million. The tract is at the corner of SR 316 and the Oconee Connector and will be accessed with a right-turn-only entrance and exit on the Oconee Connector as well as via an entrance and exit off Virgil Langford Road. According to the narrative submitted by Williams and Associates, the driveway access on the Oconee Connector was granted by Georgia Department of Transportation during the condemnation process for construction of the Connector. An 85-bed assisted living facility is proposed for the remaining 23 acres, which also will include 236,300 square feet of medical and general office space. The assisted living facility is to have 60,000 square feet of space. Access will be via two entrances off Virgil Langford Road. The value of this phase of the project is estimated at $9 million. The concept plan for the project shows undeveloped property containing wetlands between this 23-acre tract and the 5-acre tract for the hotel. It also shows a lot set aside for stormwater runoff from the project before the water reaches the wetlands. Water Oak Investment is seeking to rezone the lot for the dermatology office facility from existing B-1 PUD (General Business–Planned Unit Development) to simple B-1 (General Business). 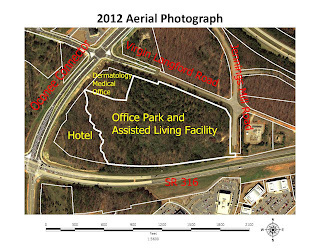 LCN Oconee LLC and Frank Halpin, owner of the 23-acre tract, are seeking the same change. 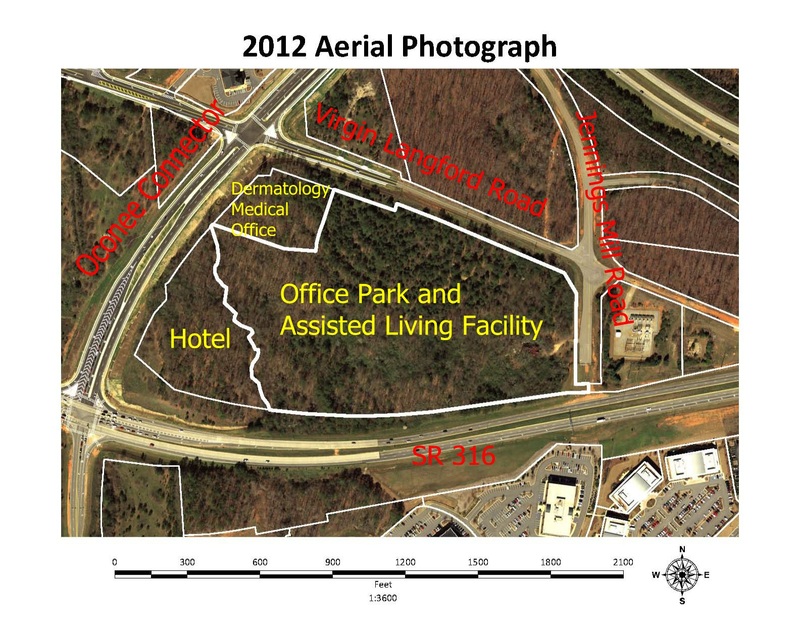 LCN Oconee and Halpin also own the 5-acre tract to be used for the hotel, and for that property they are seeking a change from B-1 PUD to B-2 (Highway Business). The B-1 Planned Unit Development classification is an old category that precludes use of the land for the assisted living facility, necessitating the rezone request. All three parcels were split from land on the south of SR 316 when that road was built. Much of the land on the south side of SR 316 that was rezoned to B1 PUD in 1994 with the parcel that will become Resurgence Park already has been developed. Because of the scope of the project, Nichols Land and Investment Company, developer of Resurgence Park, was required to submit plans to the Northeast Georgia Regional Commission for review as a Development of Regional Impact (DRI). NEGRC suggested the county and the developer should address these concerns. Following its review, the Oconee County Planning Department staff recommended approval of all three rezone requests. The reports do not respond to the concerns raised by NEGRC in the DRI. The Planning Commission, an advisory group to the Board of Commissioners, reviewed the rezone request at its meeting on July 15. Planning Commission members did ask Land Planner Williams about the amount of paving and about the creek and wetlands, according to the minutes of the meeting, but the separate votes on all three rezone requests were unanimous. The BOC on Tuesday will hold public hearings on the Resurgence Park rezone requests and on a separate request by Deborah McMillon for special use approval to allow her to operate a business in a single-family dwelling. McMillon, 1241 Trailwood Drive, west of Butler’s Crossing, is asking to be allowed to operate a tanning studio, Spray Tan Studio, in her home. One neighbor spoke against the request at the July 15 Planning Commission meeting, according to the minutes. The Planning Commission voted 8-1 to recommend approval to the BOC. The Tuesday BOC meeting starts at 7 p.m. in the courthouse in Watkinsville.